As we’ve mentioned in previous posts, Toby will put anything his mouth and start chewing except when it comes to food and treats. So, the tons of samples we got in our BlogPaws goodie bag was a great way to see what he liked and didn’t like. 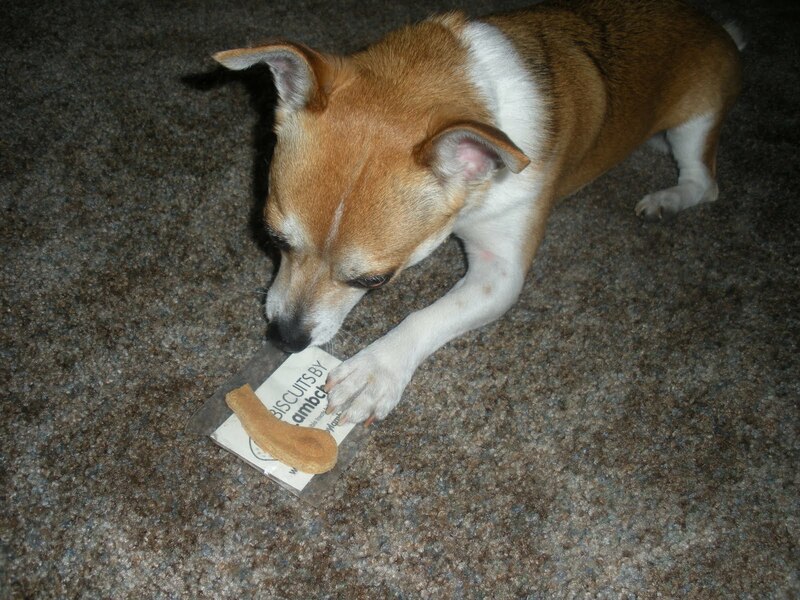 And, one of the treats he really loved was Biscuits by Lambchop — healthy, gourmet treats for dogs with food allergies and other health issues. Toby, knock on wood doesn’t have food allergies, but I’m still picky with his treats and want to make sure he is eating something of substance and not junky treats. Biscuits by Lambchop are gluten, soy, corn, rice, dairy, eggs, nuts, animal protein and preservative free and are low in fat, sodium and phosphorus. That gets four paws up in our book! They also have a very interesting story on how the company got started. The company is based in New York City, and you can purchase them right from their website. Check them out!! !